“I have a dream” is probably the most analyzed and studied speech in American history. Many around the world are aware of Dr. Martin Luther King’s famous words. You would be hard pressed to find a kid in the United States who hasn’t been exposed to this speech in school in some way. Dr. King’s words that day were more than a speech to 250,000 civil rights supporters. It was a major public relations event. The speech was live on TV and radio, and journalists reported about it in great detail. Here are some lessons from Dr. King’s PR campaign that academics – and indirectly university communicators – can emulate (note that I am not a Martin Luther King Jr expert. References are based on what I’ve read primarily on Wikipedia). 1. Tie to major a new event. Right off the bat, Dr. King found the right news peg: the 100-year anniversary of the Emancipation Proclamation. The first two paragraphs of the I Have a Dream speech open with references to this anniversary. Application: As an academic, think about how your research / book / program or whatever it is you want to position ties to news events. For example, in a previous role, I worked with professors on promoting a quarterly survey of Chief Financial Officers. We would always have meetings a few weeks before the release to figure out the links between the survey findings and what is topical in the news: a piece of legislation passed by Congress, the latest unemployment report, the most recent actions of the Fed, etc. Whatever it was that we decided was the most newsworthy hook would be the lede of our public communications. 2. Speak in plain English and remember your audience. Dr. King, who earned his PhD from Boston University, was obviously a very bright man. He probably had the “ability” to speak in very academic terms about the plight of the black person in a segregated America. Instead though, he used plain English. He referred to examples that the audience could resonate with. For example, he references disgruntled voters who vote with no hope of their voices being heard. He talks about “little black boys and black girls will be able to join hands with little white boys and white girls as sisters and brothers.” He mentions signs that say “For Whites Only”. Imagine all the tweets that could have been communicated from that speech? Application: As an academic, be sure to use clear and simple language to describe your research and expertise. Come up with some analogies, and remember your audience. Why should they care about what you are talking about? Make it personal for the readers / viewers. 3. Consistency of message. Martin Luther King had been speaking about dreams since 1960. If you refer back to some of those other dream speeches, you will notice similar language. For example, compare King’s speech to an audience in Detroit in June 1963 with the famous “I Have a Dream” speech in DC. You will notice lots of the same illustrations and points. Dr. King evidently had his talking points down, and was able to consistently deliver this message. Application: You can apply the same thing. Say you have a new book coming out or you are leading a new program. Put together your “talking points” – three main points and then different statistics and stories to back up those points. You should try to emphasize these same points consistently across your different interviews and external communications. 4. Be Personal. 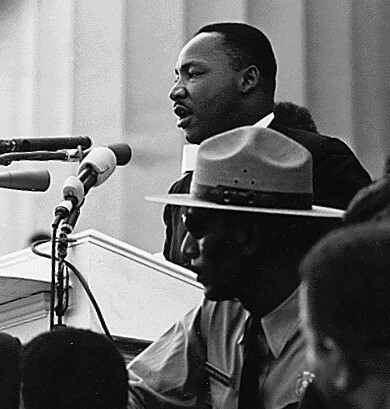 The Wikipedia entry for “I Have a Dream” notes the following: Toward the end of the speech, King departed from his prepared text for a partly improvised peroration on the theme “I have a dream”, prompted by Mahalia Jackson‘s cry: “Tell them about the dream, Martin!” At this point, King delivers some of his most memorable lines that resonated with different audiences. The conviction in which he spoke about his dream was very powerful. Application: You surely aren’t talking about an issue that would instill as much passion as the topic of segregation. Nevertheless, it helps to speak with conviction about your points. Have your talking points down pat and do practice in advance to interviews / public communications. But be sure not sound too rehearsed and scripted. Show your personal side and why you care about the topic at hand. It will in all likelihood allow your message to resonate more effectively.